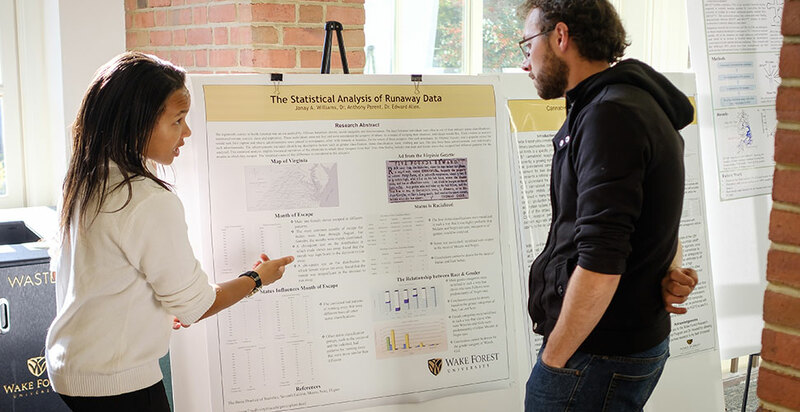 Hundreds of students, faculty, staff and family members stopped by the Z. Smith Reynolds Library atrium on Oct. 27 to explore Undergraduate Research Day, a hallmark event at Wake Forest University. Research Day, held during Family Weekend, showcases original scholarship developed through the personal interaction and intellectual exchanges between students and their teacher-scholar mentors. A total of 122 posters and 12 oral presentations featured studies on topics including the wolf spider; mental health resources for Hispanic immigrants; black holes; pottery surface treatments and heat transfer; DNA modifications; and athleticism and academic resilience. Research Day is sponsored by the Undergraduate Research and Creative Activities Center (URECA), which promotes and celebrates mentored scholarship. Senior mathematical statistics major Janay Williams conducted research on runaway slaves by analyzing data from advertisements appearing in the Virginia Gazette offering rewards for return of slaves. Williams worked with professors Edward Allen for statistical work in mathematics and Anthony Parent in history to help interpret the results. First in the Forest Scholar Janay Williams discusses her research results. 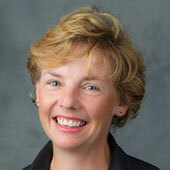 Williams is considering graduate school and possible careers in data analytics. 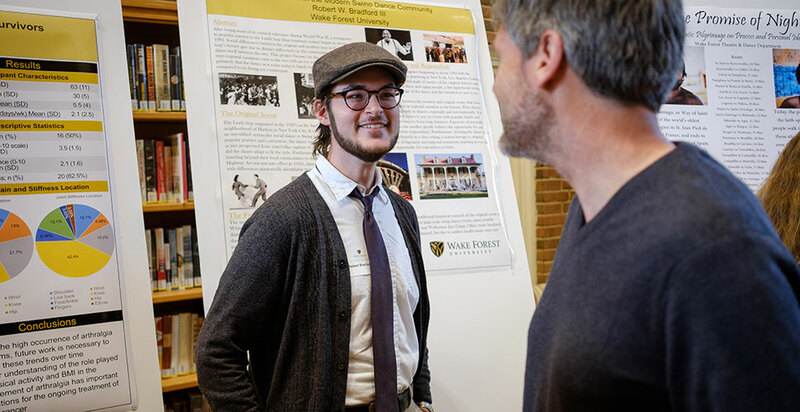 Sophomore Stamps Scholar Robert Bradford followed his passion for swing dance — looking for regional variations to the Lindy hop, the swing dance most practiced today. His research took him as far as Sweden, where a late-night television show had inspired a group of people to take up the dance. Stamps Scholar Robert Bradford studied swing dancing. Physics professor Daniel Kim-Shapiro was his project mentor.